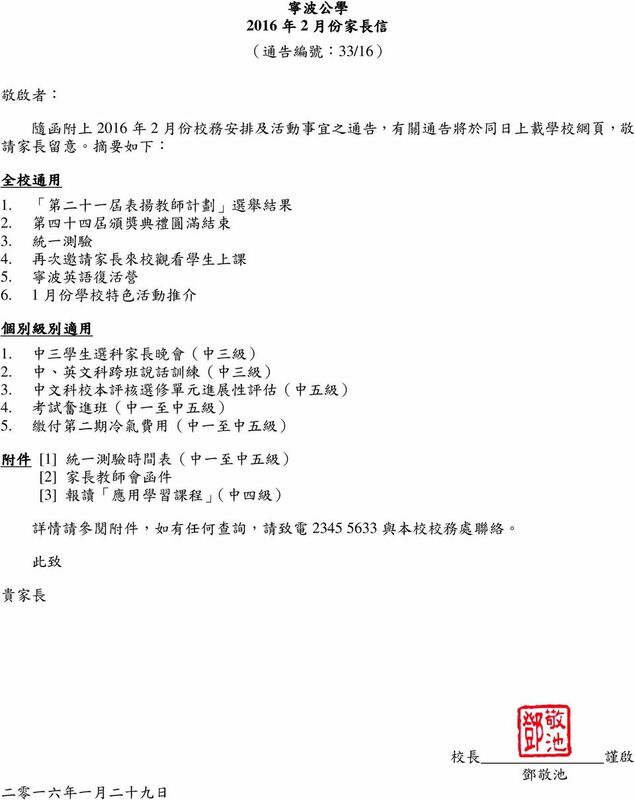 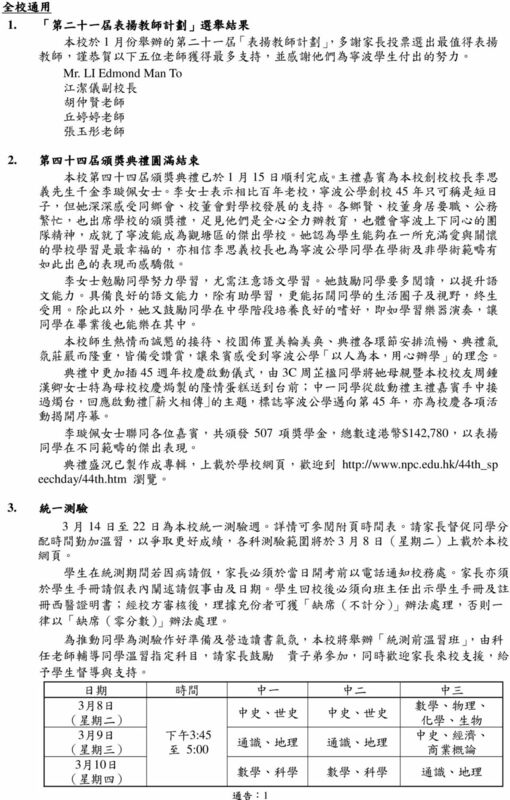 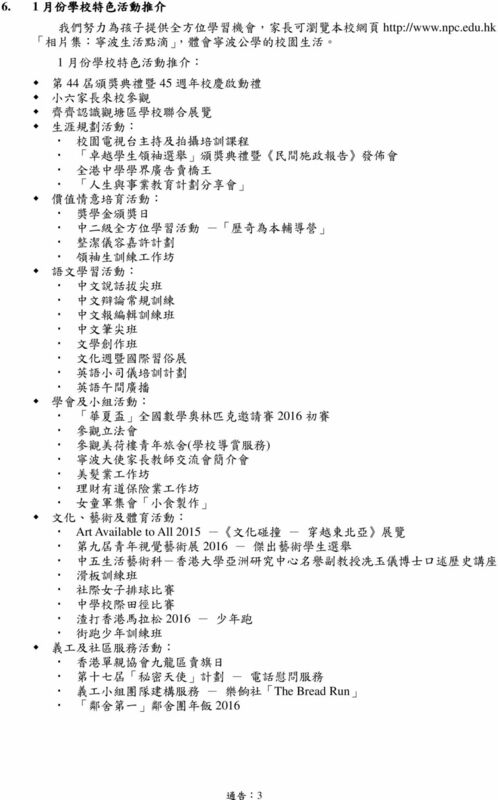 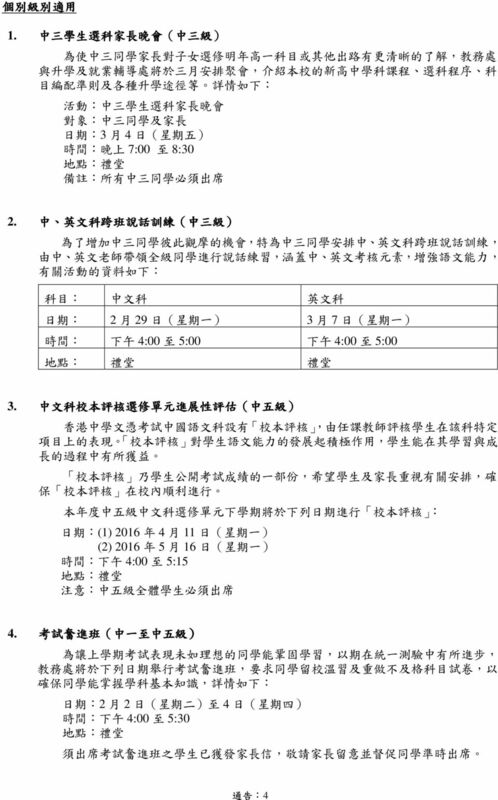 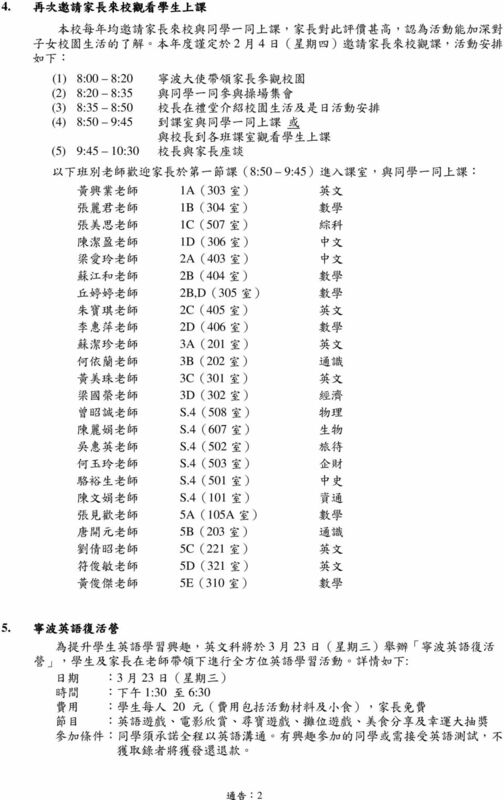 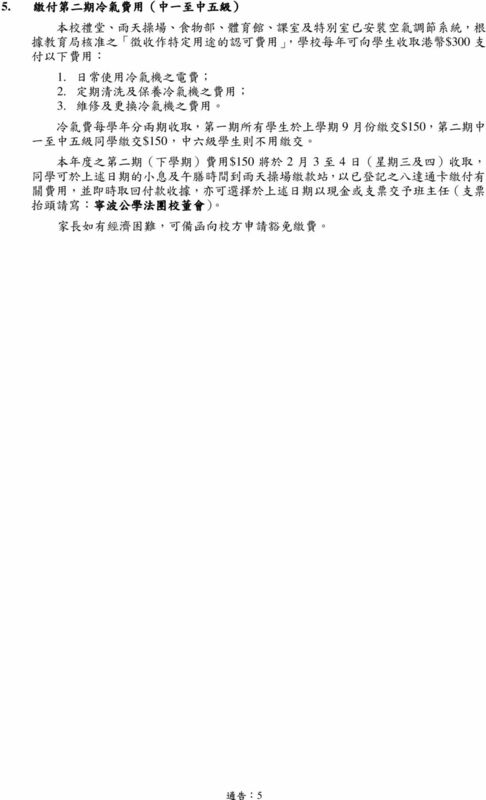 Download "(Microsoft Word - 16\246~2\244\353\256a\252\370\253H.doc)"
11 For 學 習 範 疇 課 程 組 別 目 代 碼 課 程 註 一 及 註 二 程 提 註 三 供 機 構 教 學 語 言 課 程 費 用 註 四 健 療 康 科 護 學 理 及 物 醫 英 應 用 科 學 康 藥 學 基 礎 中 文 務 護 化 驗 實 科 務 學 Animal Care 理 學 用 心 理 動 學 體 及 適 體 能 適 教 能 # 中 中 文 工 程 及 生 產 機 械 木 電 機 及 車 科 技 訊 機 及 能 源 工 程 務 工 程 空 腦 學 鑑 證 科 技 中 學 宇 科 技 文 或 英 文 Aviation Studies 有 生 在 同 一 的 個 課 課 程 程 已 組 載 別 錄 內 於 只 資 可 歷 修 名 讀 冊, 一 屬 科 於 有 # 的 課 程 的 證 書 課 程 學 生 成 功 完 成 有 的 應 用 學 習 課 程, 除 了 會 得 到 香 港 中 學 註 文 憑 資 歷 之 外, 亦 會 獲 課 程 提 供 機 構 頒 發 資 歷 架 構 第 三 級 證 書 詳 情 可 瀏 覽 資 歷 名 冊 網 頁 明 課 程 提 供 機 構 愛 中 社 城 演 浸 文 區 市 藝 會 書 學 大 院 學 專 持 業 續 進 教 修 育 學 院 Course 註 專 業 進 修 學 校 Caritas School 所 香 港 專 業 School 將 獲 有 在 教 資 育 局 助 中 及 學 校 官 全 立 數 嶺 職 中 資 南 業 學 助 大 訓 按 課 學 練 位 程 持 局 津 費 續 貼 用 進 中 修 學 院 直 接 資 助 計 劃 的 中 學 及 設 有 高 中 班 級 的 特 殊 學 校 修 讀 由 課 程 發 展 議 會 所 建 議 之 高 中 課 程 的 學 生, The School Hong School Lingnan Vocational All 附 件 :3 Area of Studies Applied Science 12. 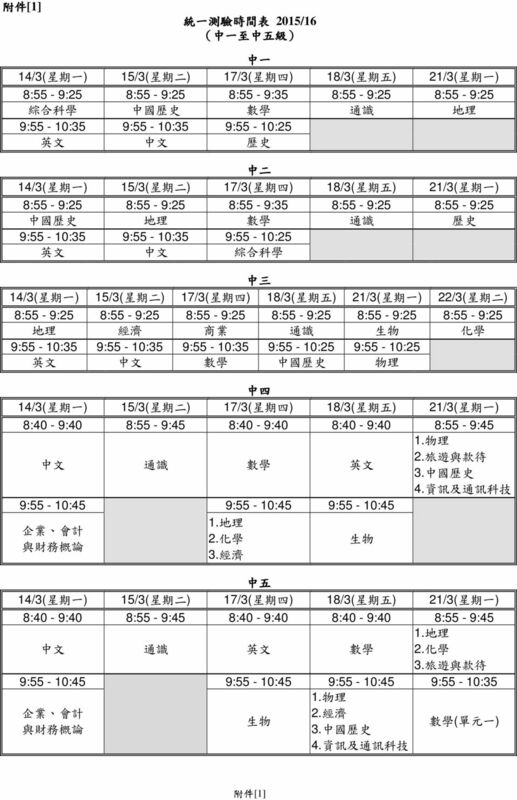 醫 13. 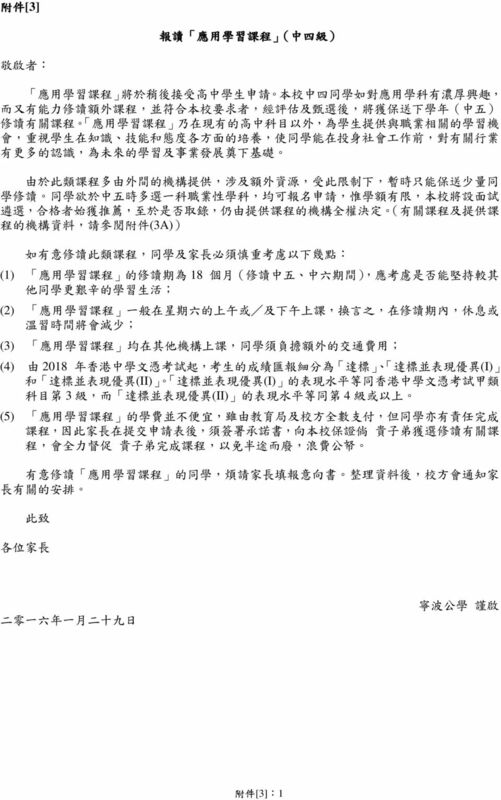 心 14. 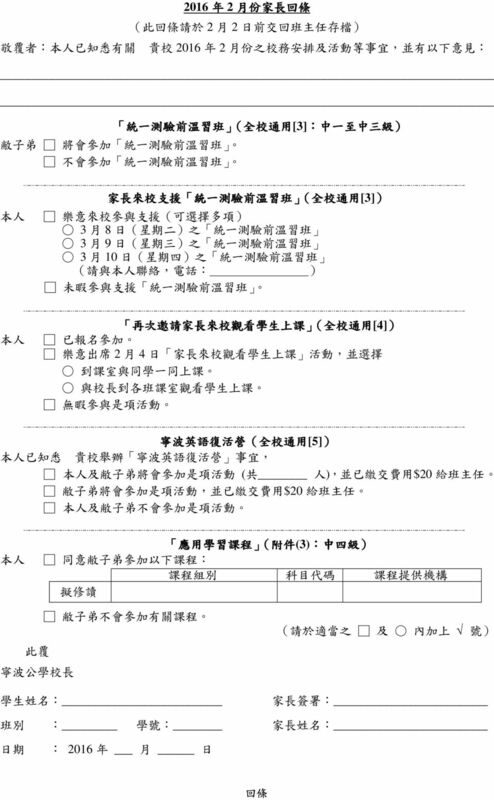 運 Course Cluster 科 Medical Science and Health Care 動 Psychology Sports Subject Code 689 動 592 中 618 健 660 醫 662 應 666 實 627 運 學 # # Course NOTE 1 & NOTE 2 課 Foundation in Medicine Course Provider NOTE 3 CityU (SCOPE) HKU (SPACE) Health Care Practice CICE 中 Medical Laboratory Science Applied Psychology # Practical Psychology # 練 # Exercise Science and Health Fitness # HKU (SPACE) LIFE HKBU (SCE) HKBU (SCE) 課 Medium of Instruction Course Fee NOTE 4 (HK$) 23,000 14,800 13,900 15,600 15,200 13,500 17,000 土 運 汽 資 中 674 HKCT 12,000 Sports and Fitness Coaching # Automotive Technology CICE 12,650 Civil, 服 電 航 Electrical and Mechanical 683 Engineering Electrical and Energy Engineering VTC 13, Engineering Information 684 HKU and Computer Forensic Engineering Technology 一 屋 中 13,000 (SPACE) Production 640 HKU 14,500 二 17. 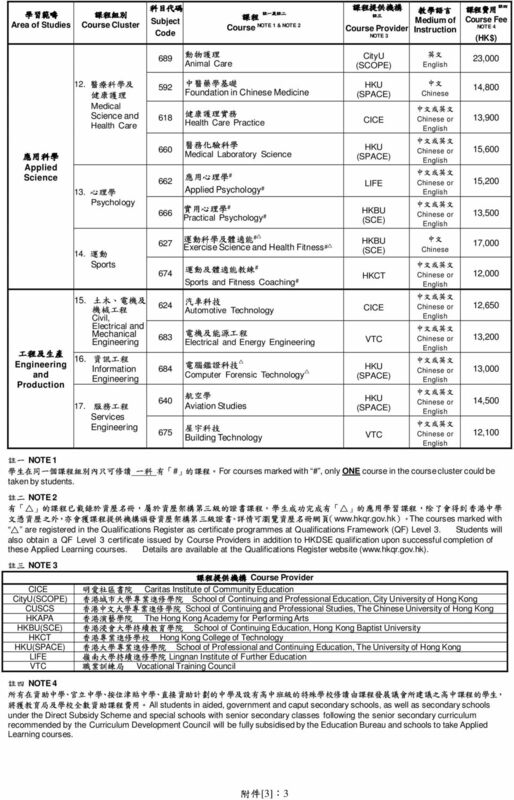 (SPACE) Services Engineering 675 Building Technology VTC 12,100 NOTE 1 三 ( courses marked with #, only ONE course in the course cluster could be taken by students. 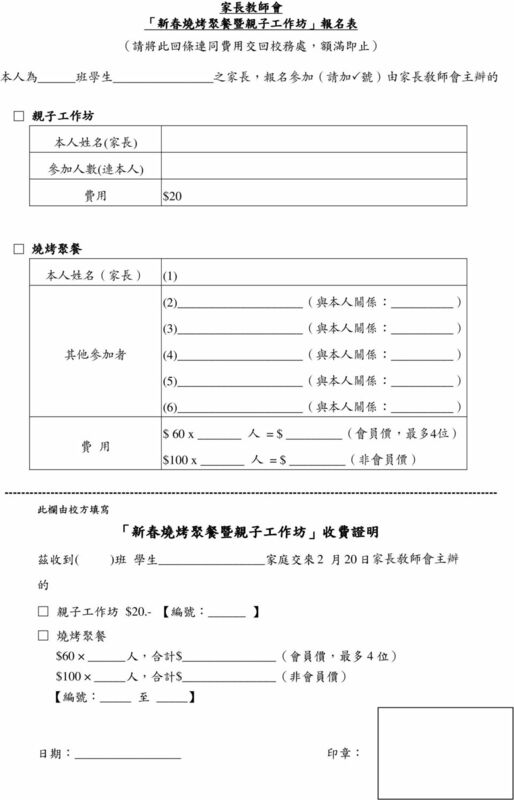 NOTE 2 The courses marked with are registered in the Qualifications Register as certificate programmes at Qualifications Framework (QF) Level 3. 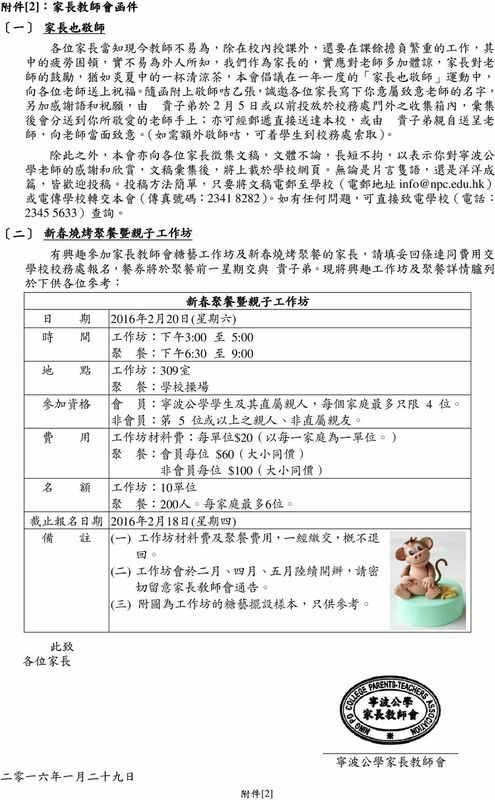 Students will also obtain a QF Level 3 certificate issued by Course Providers in addition to HKDSE qualification upon successful completion of these Applied Learning courses. 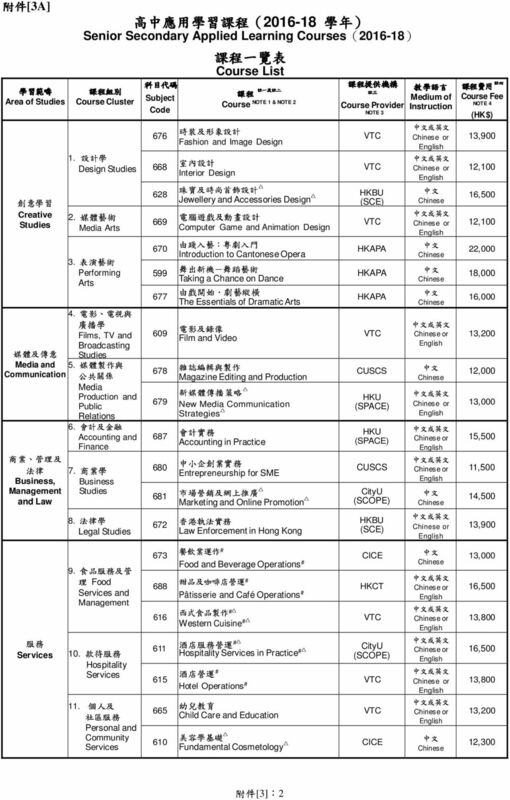 Details are available at the Qualifications Register website ( NOTE 3 Provider 四 CICE Institute of Community Education CityU(SCOPE) of Continuing and Professional Education, City University of Hong Kong CUSCS of Continuing and Professional Studies, The University of Hong Kong HKAPA Hong Kong Academy for Performing Arts HKBU(SCE) of Continuing Education, Hong Kong Baptist University HKCT Kong College of Technology HKU(SPACE) of Professional and Continuing Education, The University of Hong Kong LIFE Institute of Further Education VTC Training Council NOTE 4 students in aided, government and caput secondary schools, as well as secondary schools under the Direct Subsidy Scheme and special schools with senior secondary classes following the senior secondary curriculum recommended by the Curriculum Development Council will be fully subsidised by the Education Bureau and schools to take Applied Learning courses.